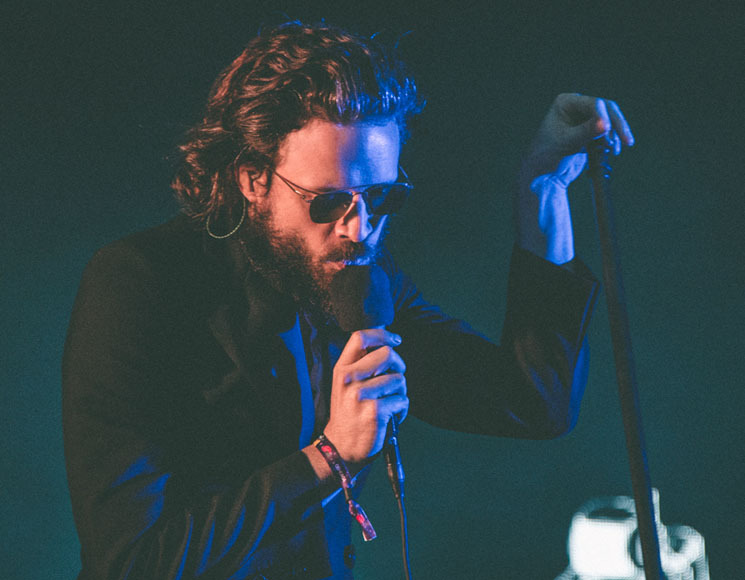 Taking to the stage in a long, black topcoat and sporting sunglasses at 8:30 p.m., Father John Misty launched immediately into "Pure Comedy," the title track off his latest release, while morbid, black and white cartoons depicting death and destruction rolled along on the screen behind him. Slotted after the Arkells, who had just wrapped up an uplifting performance wherein they asked everyone to "hug your neighbour and feel the love," Father John and his bearded backing band were quick to provide the antithesis to that optimistic performance. While the wind began to pick up, J. Tillman moved through "Total Entertainment Forever" and "Things It Would Have Been Helpful to Know Before the Revolution" with ease; his voice never faltered as he danced and threw himself about the stage with abandon. Near the end of the song he accidently squished a bug on his forehead and dragged its remains across in a bloody streak before launching into "The Ballad of the Dying Man." After wiping off the smear and commenting that it would be interesting to invent a genre of music where you could casually rub blood across your face, the band moved in to "Chateau Lobby #4" as Father John lit a cigarette, and as the evening rain finally began to pour. Ending his set with "True Affection" and "I Love You, Honeybear," Father John Misty gave the audience exactly what they were hoping to see.